Office Live Workspace (Beta) Finally Goes Live. Still Needs Work. It’s painful to watch Microsoft wake up slowly to the threat posed by a growing gaggle of Web-based office productivity software, led by Google Docs and Spreadsheets. Back in October, Microsoft announced its intention to make Office Live actually revolve around sharing documents online (as opposed to the website-hosting and e-mail service that it was before). As a result, Office Live will now have two services: Office Live Small Business and Office Live Workspace. Even though Microsoft announced it two months ago, the (still-private) beta for Office Live Workspace launches today. That means beta users can finally start testing the service. You can sign up here to get on the waiting list for an invite (Windows Live ID required). Microsoft briefed me on the service and gave me access to a demo account. I should note that at the time of the initial announcement, we were underwhelmed. For one thing, Microsoft did not explain whether the new Office Live Workspace would even let you create new documents online or edit existing ones after you uploaded them to the Web. Well, you can do both, sort of. The big surprise is that Office Live Workspace includes a decent online word processor called Web Notes that is comparable in most ways to other Web-based alternatives. It is fast, supports a handful of different fonts, font sizes, and formatting. Nothing too fancy, but enough to write a memo, take notes, or even write a draft of an article. There is no spellcheck, though. And—its Achilles’ Heel—you cannot export a document from Web Notes to your desktop. Anything you write in Web Notes is trapped inside Office Live. 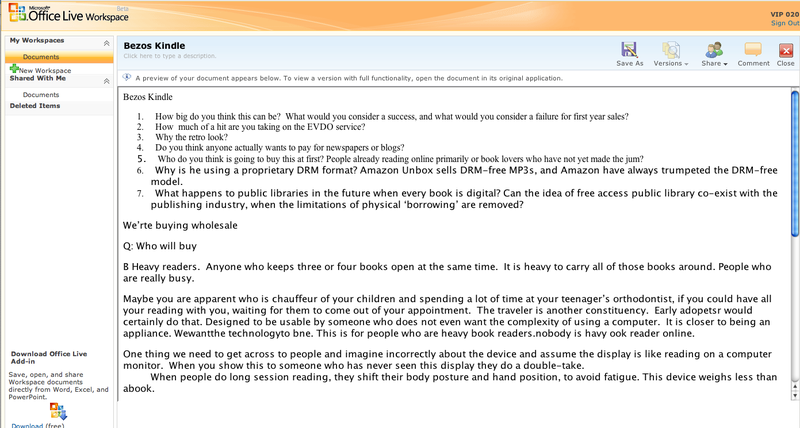 If Web Notes feels like an afterthought, that is because it is. The way you are supposed to write documents in Office Live is with Microsoft Word. 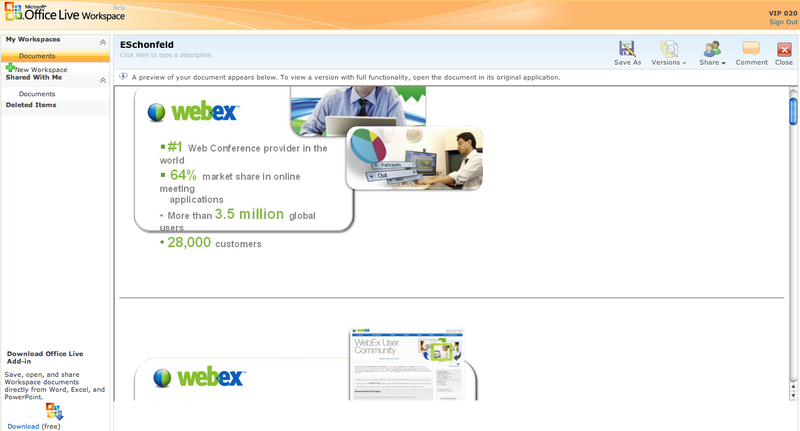 Once you upload a Word document to Office Live, it automatically syncs every time you make a change on your desktop. So you edit in Word, and all the changes are reflected in the version on Office Live. (Goodbye, Live Documents). 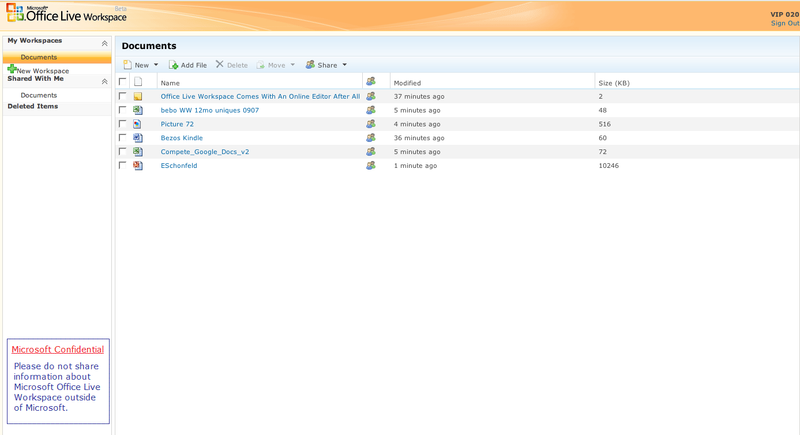 Office Live is a hosted version of Sharepoint. Unfortunately, this works only if you have a Windows machine running XP or Vista, with Office XP or a later version. The syncing does not work on a Mac at all. Assuming you do have a PC running a recent version of Office (a safe assumption for most people), the integration and syncing works pretty seamlessly. With one click you can save a document to your desktop and it opens up in Word, where you can work on it. Then when you close it, the new version is saved to Office Live automatically. On Office Live, you can share the document with others, who can make comments inside Office Live, or edit it themselves by going through the same process of downloading it into Word. Office Live keeps track of all the different versions. There is a certain logic to this. For one thing, it protects Microsoft’s desktop Office cash-cow business because you need Office to take advantage of Office Live. But given that most people are still more comfortable using the desktop apps they are already familiar with, this is not necessarily a bad thing. Letting people continue writing in Word and auto-syncing to Office Live plays to Microsoft’s strengths and makes online document sharing easy. People hardly have to change their behavior at all. The problem is that Microsoft does not give you the option to do things any other way. 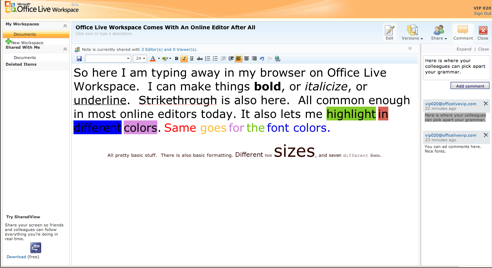 Office Live, at this early stage, is nothing more than an online viewer and file-sharing service. Microsoft upped the storage limit to 500 MB, enough for more than 1000 documents. You can upload many file types—Word docs, Excel spreadsheets, images, PDFs—but they all remain read-only within Office Live. The only exception is documents written in Web Notes, which can’t be exported unless you cut and paste. It is enough to drive you crazy. But come on. If Google and a dozen startups can create online productivity apps that let you edit in the browser, so can Microsoft. And those potential competitors are not standing still. Every month Microsoft waits to fully wade into the Webtop waters, is another month that Google, Zoho, Adobe, Glide, and the rest have to close the gap with Office on the desktop. And who knows? They might even start to steal its customers.